Resourcefulness has been a key component of Japanese life for centuries. In design, one sees this most dramatically with materials and objects being repurposed, recycled, or reused. This nineteenth-century cloak is called Hikimawashi kappa, which literally means pull-around (hikimawashi) cape or raincoat (kappa). Capes were not common in sixteenth-century Japan. This style was modeled on the Capa overcoat, which Spanish missionaries wore in the Momoyama era (1573–1615). The raincoat would originally have been made waterproof with tohyu-gami, oil paper made from the paulownia tree, which would have been encased between the lining and the outer layer. 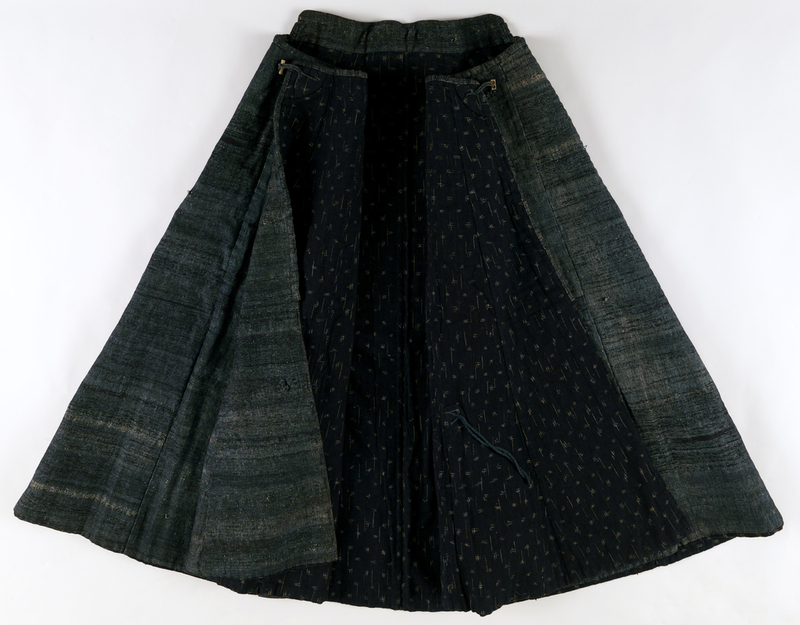 Kappa became a more prevalent outerwear garment during the Meiji era. This cape-like raincoat with a stand-up collar is tied around the neck by bone clasps and belted at the waist by a knotted cord. This garment is made from leftover indigo-dyed homespun cotton collected from home production or purchased from local commercial weavers. Traditionally, broken yarn of random colors was collected after weaving. They were reused to create new fabrics called zanshi-ori, zanshi meaning “vestige” or “leftover.” Cotton thread was a precious commodity during the late Edo period in rural Japan and none was wasted, regardless of how rough or worn. For instance, if the lengths of yarn were not long enough, they were simply knotted together to create a longer strand with varied shades of blue. Because of the use of highly diverse remnant threads in the weft, combined with a more regulated warp, an overall pattern of irregular striations is created. This raincoat boasts a unique woven texture with very fine dark blue warps and thick recycled cotton wefts. It also reflects a spirit of eco-friendly and sustainable textiles and the idea of constantly finding ways to repurpose materials at hand, with nothing wasted in production.